My mother passed away five years ago and we had been thinking about how we could best honor her memory. She was an avid reader and instilled that thirst for reading in her four children and seven grandchildren. We read an article about the Little Free Library program in Parade magazine and decided that would provide the perfect vehicle to keep her memory alive. My husband, a self-taught woodworker, found some old Eastern pine at a local lumberyard and set to work building our library. We started the library with books that we had recently read and enjoyed. We purchased some children’s and young adult books to complete the collection and quietly placed the library along the road next to our mailbox. Our little free library has been in business for about three weeks now and seems to have developed a dedicated following here at the lake. 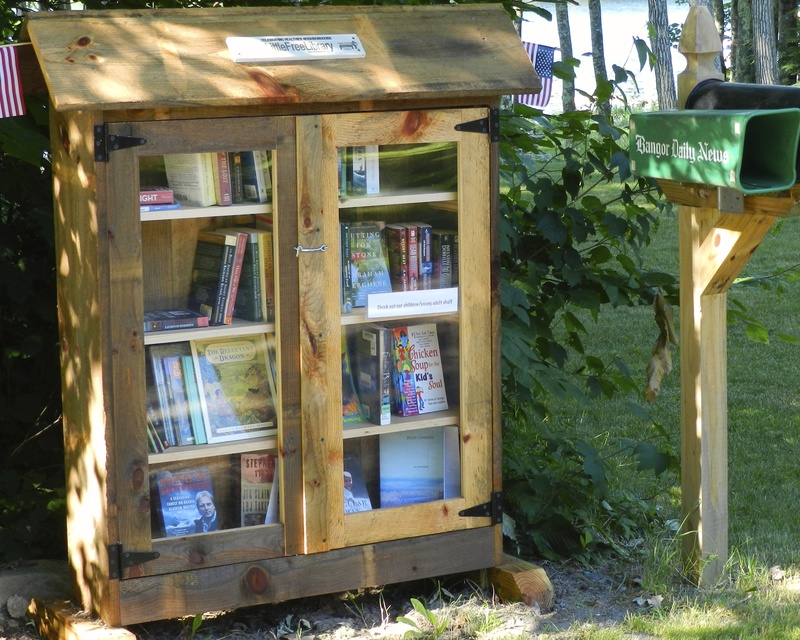 We have witnessed both “summer people” and year-round residents taking advantage of the Little Free Library. Some have added to the library even when they weren’t in need of a new read. Other, following the informal policy, take a book and leave a book. Kids seem excited that they are able to exchange an old book that they may have outgrown for another that catches their interest. Initially, we thought about putting the library away for the winter. Now we plan to move it up to our covered porch so that the year-round residents can continue to find something new to read on the long, cold winter nights in Maine. This entry was tagged Little Free Library, Maine, Read. Bookmark the permalink.